I don’t think I’ll ever forget where I was a year ago today. In the living room of my apartment, watching the Mighty Ducks on TV with two of my friends. It’s funny how certain things will stay with you – I remember my phone vibrating and not wanting to check it, thinking it would be something I could get to later. The text message wasn’t even that urgent – just asking me if I had been on Facebook yet. I met Mandi Schwartz when I started grade nine at Notre Dame College, in Wilcox, Saskatchewan. Mandi was a year older than me, in the same grade as my brother. She was the kind of person you were immediately drawn to – she was incredibly smart, kind, and beautiful. As a quiet 14 year old, my first year away from home, I looked up to her – she seemed so sure of herself, with a quiet, humble confidence that I hoped one day to emulate. We played different sports – Mandi was an all-star in everything she did, though most notably hockey. She was so good she made me wish I still played. We got the chance to work together when we both injured our knees. Our physio appointments in Regina coincided for traveling purposes, and we worked with the same therapist, so we ended up doing all the same exercises. That was the first time I really got to see Mandi in the way her teammates saw her – the hardest working, most determined girl you’ve ever met. Mandi was always pushing our therapist for some more challenging exercises – upping our limited weights, doing a couple extra reps, balancing for just a little bit longer. She pushed me to get better faster – and I’d like to think I pushed her too, though she never needed that extra push. Mandi’s determination and positivity came from inside herself. After finishing our physio, we returned to our respective sports – Mandi, back on the ice, and me on the pitch. And before you knew it, Mandi had graduated with a scholarship to play hockey at Yale. She had one of the highest averages coming out of grade twelve, so it was a perfect fit for her. 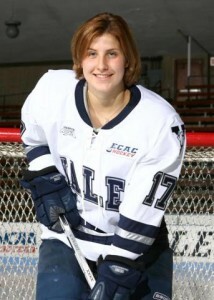 At Yale, she played 73 consecutive games, scored 28 points, and earned ECAC All-Academic Honours. Something went wrong during the 2008-2009 season, however. Mandi started feeling tired, and she was unable to perform on the ice like she always had before. So, in typical Mandi fashion, she started putting in extra workouts to try to get her fitness back. Eventually, she went for tests, and in December of that year, was diagnosed with acute myeloid leukaemia. The day I heard she was diagnosed is another day I won’t forget. There were four of us Notre Dame grads going to university together, so we all got together and called her. She still sounded the same – her positive attitude could be heard across the phone, along with a ‘don’t worry about me,’ attitude, as she asked me if I was ready for my December finals. She seemed surprised that we had all gotten together to call her – Mandi was so humble, she would never have expected or asked for all the attention her struggle brought her. The next two and a half years were filled with ups and downs for Mandi, her family, and her friends – the cancer went into remission and she returned to Yale, the cancer came back and she needed a stem cell transplant. Her younger brothers both attended Colorado College on hockey scholarships. A stem cell donor was found, but her cancer had come back too strong and the surgery had to be rescheduled. Her youngest brother was drafted in the first round by the Blues. She and her boyfriend got engaged. She had her stem cell transplants in September of 2010 and the cancer went back into remission. She watched her youngest brother play for Team Canada at the World Juniors. And then her cancer came back. A year ago today, I found out my friend had finally lost her fight. I won’t forget that day, but more importantly, I won’t forget Mandi. Her strength of character, her positive attitude, and the way she put everyone first even when she was at her lowest points all attest to the amazing individual she was. Mandi brought the hockey world together in her search for a donor. She brought hope to so many people – young girls playing hockey, thousands of individuals who were also searching for a donor, and everyone she ever talked to. I won’t forget our first drive together to go to Regina for physio either. It was a sunny, beautiful fall day, and there was country music playing on the radio. Within the first couple minutes of being on the highway, Mandi turned to me. I held on to the wheel as she pinned her hair back. You inspired me then, Mandi, just as you inspired me throughout the rest of high school, your time at Yale, and your battle with leukemia. You will always be my inspiration, and an inspiration to everyone who had the privilege of being part of your life. 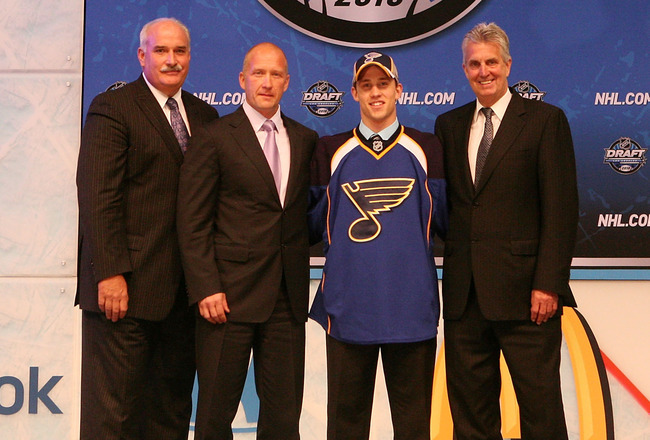 Jaden Schwartz, a sophomore forward from Colorado College, has signed an entry-level contract with the NHL-leading St. Louis Blues. Exactly two weeks after making no additions before the NHL trade deadline, the injury-plagued Blues will benefit in adding their 2010 first-round draft pick for the stretch run. GM Doug Armstrong and Coach Ken Hitchcock felt their current roster needed a boost, with the returns of Alex Steen and Matt D’Agostini still in question. Fresh off a disappointing loss that eventually ended his collegiate career, Schwartz and the Blues quickly worked to get a contract in place. At Colorado College, the shifty forward amassed a career 32 goals and 56 assists in just 60 career games. The Canadian native will look to add anything he can to the team that sits atop the NHL standings. Schwartz will bring a great energy to an already strong team. Getting right into the swing of things with the NHL club, the Blues’ 2010 No. 14-overall draft pick possesses both the skills to perform as well as the will to use this as a learning opportunity. At just 19 years old, Schwartz is extremely knowledgeable when it comes to hockey. He works hard and loves being involved in the action, a quality the Blues value in his game. He has the potential to make a game-changing play on every shift. Part of the reason Armstrong chose to sign the young winger now gives credibility to the mental game he possesses. Schwartz is a natural leader, shown by his captaining of Team Canada in the 2012 World Juniors. You have to be if you are going to survive in the NHL at the age of 19. While not an excessively flashy offensive talent, Schwartz’s skill set is one that will mesh well with the St. Louis Blues style of play. Two things that bode well for a playoff run—a smart, grind-it-out style of play and depth—are both aspects Schwartz adds to the Blues. To that, Schwartz adds a natural playmaking ability that could be lethal once he develops. Hitchcock has yet to speak about what line Schwartz will play on. Regardless, expect him to replace some of the versatility lost to the injury bug. Work on multiple lines is probable, as Hitch is known to switch his lines on a nightly basis. This gives the young Canadian a chance to prove himself while still allowing him an opportunity to gain comfort at the NHL level. Schwartz’s contract makes him immediately eligible to join the team. He is also eligible for the 2012 Stanley Cup Playoffs. It remains uncertain when Schwartz will make his NHL debut. Be sure Coach Hitchcock will unveil his new weapon when the time is right. In the end, adding a player with great playmaking ability and a natural sense for the game was too good of an opportunity to pass up for Doug Armstrong and company. Especially when that player is as well-grounded as Jaden Schwartz. Hitchcock certainly welcomes the addition to his offensive arsenal. As for Schwartz, a chance to contribute to a playoff-bound St. Louis Blues team this year is a tremendous opportunity. The worst case scenario is he gains his NHL footing sooner than expected, knocking the nerves out before next year. The best case scenario? You can imagine. Earlier in March, CBS Sports Network recently profiled the family of Yale women’s ice hockey player Mandi Schwartz ’10 (1988-2011). Mandi’s brothers, Jaden and Rylan, both play for Colorado College. 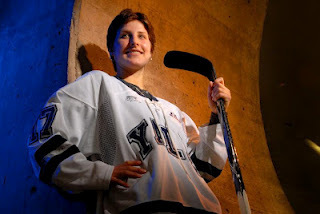 NEW HAVEN, Conn. – It has been nearly a year since Yale women’s ice hockey center Mandi Schwartz ’10 (1988-2011) passed away after battling cancer for more than two years. Yet she continues to inspire efforts by her Bulldog teammates to help others. After the final game of the 2011-12 season at Harvard on Saturday afternoon Feb. 18, the Yale team traveled North instead of heading right home to New Haven. The Bulldogs attended a Boston Blades Canadian Women’s Hockey League (CWHL) game in Reading, Mass., that served as a fundraiser for the Mandi Schwartz Foundation — the charity that Yale senior captain Aleca Hughes (Westwood, Mass.) started in Mandi’s memory. Donations for the foundation were accepted at the game, and t-shirts from the most recent “White Out for Mandi” (the Yale team’s annual fundraiser at Ingalls Rink) were available as well. Hughes dropped the ceremonial first puck and sophomore forward Patricia McGauley (Wilcox, Sask. ), who is from the same home town and high school as Mandi, sang the National Anthem. The Blades’ roster features two players with Yale connections — Bray Ketchum ’11 and assistant coach Jessica Koizumi. Koizumi had a pair of goals and Ketchum had an assist as the Blades beat Burlington 6-0. NEW HAVEN, Conn. – ECAC Hockey has renamed its Student-Athlete of the Year Award in memory of Mandi Schwartz ’10 (1988-2011), the Yale women’s ice hockey forward whose battle with cancer inspired people in the hockey world and beyond to help save lives in her name. The announcement was made Friday, on what would have been Mandi’s 24th birthday. Mandi, who passed away Apr. 3, 2011 after battling acute myeloid leukemia for more than two years, was a three-time ECAC Hockey All-Academic Team selection whose gentle nature and selfless approach to life endeared her to everyone she met. She attended Athol Murray College of Notre Dame prior to Yale. On Dec. 8, 2008 — just four days after extending her streak of consecutive games played to 73, picking up an assist in Yale’s 4-1 win over Brown at Ingalls Rink — Mandi was diagnosed with cancer. She returned home to Saskatchewan for treatment, and on Jan. 8, 2010, after five rounds of strong chemotherapy and 130 days in the hospital put her in remission, she returned to Yale for the spring semester. She was planning to return to playing hockey in the 2010-11 season, but in April of 2010 she learned that the cancer had returned. She would need a stem cell transplant — essentially, a new immune system — to have any hope of long-term survival. In an effort to save her life and the lives of others facing similar illnesses, Mandi’s Yale teammates rallied behind her cause. Starting in 2009, they helped organize annual marrow donor registration drives to help patients in need of genetic matches for stem cell transplants. They campaigned to raise awareness of the value of donating umbilical cord blood, which can also be used to help patients in need. And they held numerous fundraisers, centered around the annual “White Out for Mandi” game at Ingalls Rink. Yale senior captain Aleca Hughes (Westwood, Mass. ), who organized many of Yale’s efforts, has also started the Mandi Schwartz Foundation to continue honoring Mandi’s memory by helping others. Mandi received a stem cell transplant using umbilical cord blood in September 2010 at the Fred Hutchinson Cancer Research Center in Seattle. But a biopsy in December 2010 revealed that the cancer had returned. She passed away on Apr. 3, 2011 at the age of 23. Just prior to that, Yale had named it annual marrow donor registration drive in Mandi’s memory. These drives continue to be led by the field hockey, football and women’s ice hockey teams. To date, the drives have added approximately 2,500 people to the Be The Match registry, including a record 921 in 2010. At least six life-saving matches for patients in need have been located through these efforts. One donor was a fellow Yale student-athlete, field hockey player Lexy Adams (Lancaster, Pa.). The date of the 2012 drive will be announced shortly. ECAC Hockey’s Mandi Schwartz Student-Athlete of the Year Award goes to a student-athlete who excels in the classroom, participates in fifty percent of the team’s games, and demonstrates leadership on and off the ice. Each head coach nominates a student-athlete, and a committee made up of school administrators has the task of selecting the recipient. The Student-Athlete of the Year Award was first presented in 2007. Yale has had one player win the award — Jackee Snikeris ’11 last season — and three other finalists (Kelsey Johnson ’07 and Danielle Kozlowski ’09 twice). On the last home weekend of women’s play at each ECAC Hockey school, the Mandi Schwartz Student-Athlete of the Year finalists will be recognized on the ice as part of each program’s senior weekend. This will begin this weekend as Clarkson and St. Lawrence cap off their regular-season home schedules. The winner of the award will be announced on Mar. 1 at the ECAC Hockey Tournament Championship Banquet. October 8, 2011 — On Sunday, three Yale alumni will participate in the “Run for Mandi” to honor former women’s ice hockey player Mandi Schwartz ’11, who lost her two-year battle with leukemia in April. 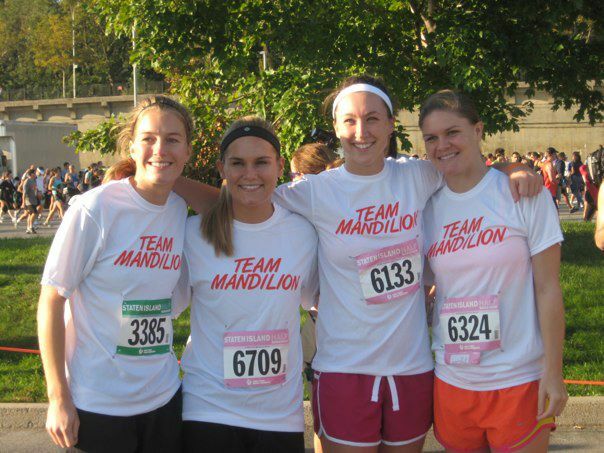 Alyssa Clarke ’09, Bray Ketchum ’11 and Jackee Snikeris ’11, who all skated alongside Mandi on the hockey team, will run in the New York Road Runners Staten Island Half-Marathon in order to collect donations for the Mandi Schwartz Memorial Bursary. All proceeds will benefit the Mandi Schwartz Memorial Bursary, an organization that was established to raise money for Athol Murray College of Notre Dame, Mandi’s high school in Wilcox, Saskatchewan, and the Leukemia and Lymphoma Society of Canada. Earlier in March, CBS Sports Network recently profiled the family of Yale women’s ice hockey player Mandi Schwartz ’10 (1988-2011). Mandi’s brothers, Jaden and Rylan, both play for Colorado College. Click Here to view video.